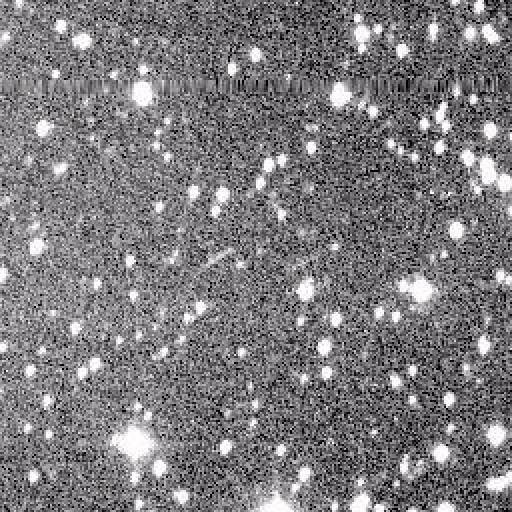 This animated gif of the discovery images of Potentially Hazardous Asteroid (PHA) 2005 YU55 taken with the Spacewatch mosaic of CCDs on the Steward Observatory 0.9-meter f/3 telescope on 2005 Dec 28 at 06:01, 06:26, and 06:52 UTC. Exposure time for each pass is 2 minutes. The bandpass is 515-900 nm, essentially V+R+I. The original pixels of one arcsecond in size are oversampled in this display, so no higher resolution images are available. 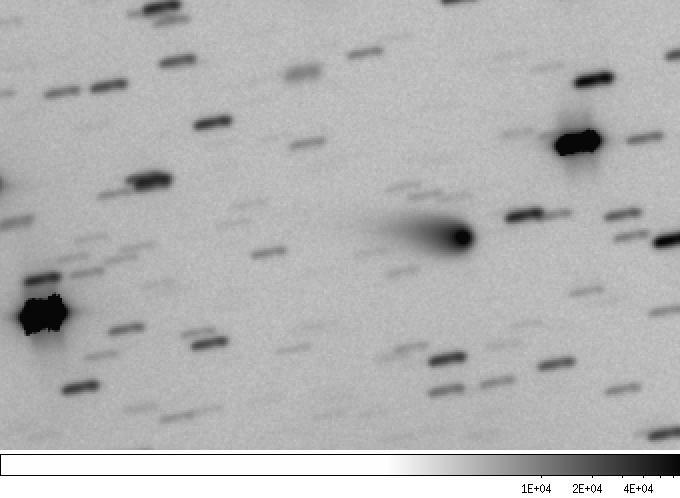 The asteroid brightness was V magnitude 21.4, near the limit of detection of such exposures. The angular motion was 123 arcseconds per hour so the displayed motion spans 105 arcseconds. 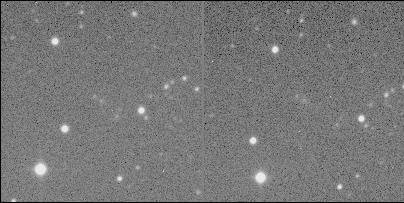 The asteroids images are trailed about 4 pixels in each image. The sky was clear and conditions were excellent. Image created by Jeff Larsen. 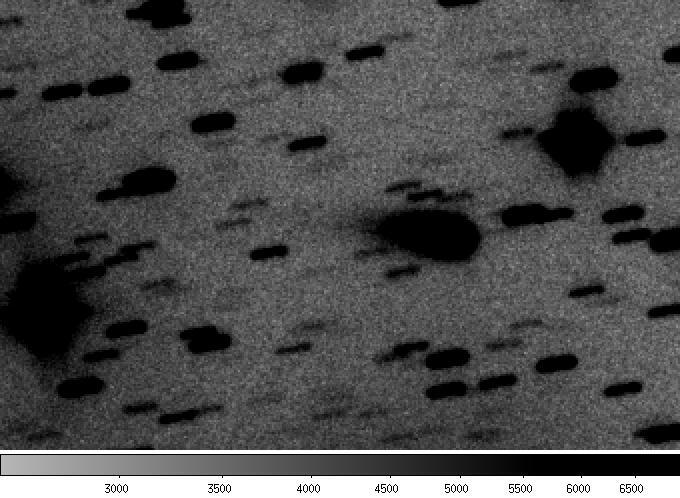 Some sample Spacewatch images of the near-Earth asteroid 1994 XM1 (obtained by Jim Scotti) are shown below. The integration time is about 150 seconds. The field is 5.1 x 4.5 arcminutes on a side with North at right, East at bottom. 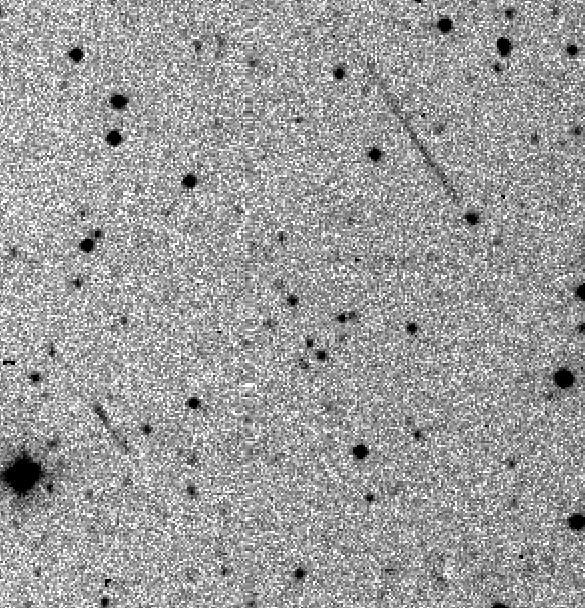 The asteroid appears as a trail near the center of the image. The images were obtained on 1994 December 9 at 05:07 UT. 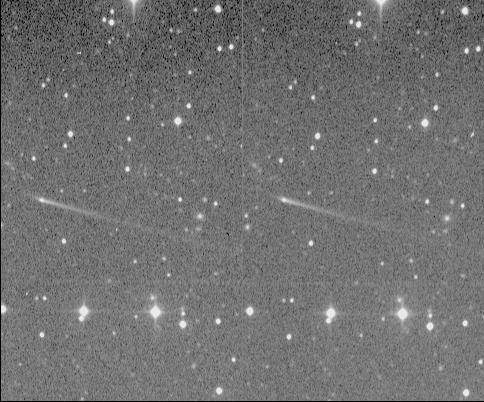 Compare this image to the image on the right which shows the asteroid some 4.5 hours later. The asteroid was about 550,000 km away at the time of this image, on its way to a record close approach of some 105,000 km, just 12 hours later! 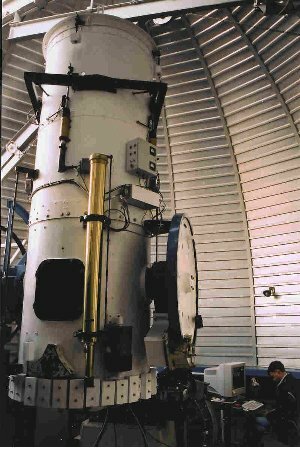 The Spacewatch telescope is used to survey for Near Earth Asteroids (NEAs) during the 20 nights centered on New Moon, each lunation. Spacewatch detects typically several thousand asteroids each lunation and identifies approximately 1 NEA for every 900 asteroids. Most of the detected asteroids orbit in the "Main Belt" between Mars and Jupiter. NEAs are identified by their motion on the sky. When they are near the Earth, they normally move very quickly, often more than a few degrees per day, leaving trailed images. Most other NEA surveys have detected many of their NEAs in this manner also. 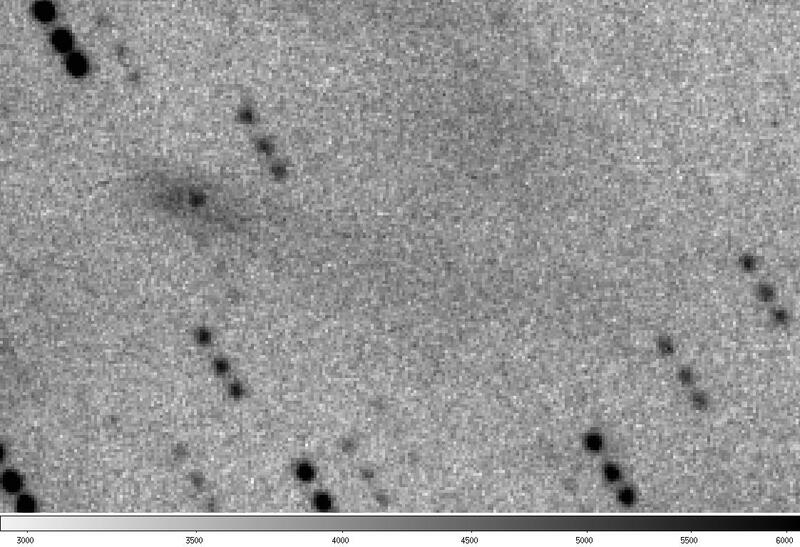 Even though Spacewatch uses a short integration time of just about 150 seconds, several objects per year are found with exceptionally long, usually very faint, trails. We call them "Very Fast Moving Objects," or VFMOs, and they typically move between 10 and 60 degrees per day at the time of discovery. 1994 XM1 is an example of a VFMO. Often, a VFMO will be seen to rapidly accelerate or decelerate in angular speed. 2 VFMO's at ONCE! One lucky night (1994 April 7), our observer found a 2nd VFMO while following up a first VFMO discovery from half an hour earlier! 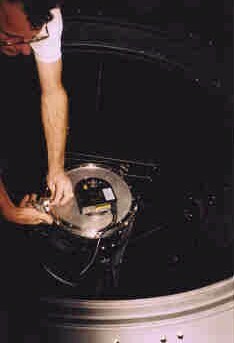 This picture shows the asteroids 1994 GK and 1994 GL. 1994 GK is the longer trail in the upper right, while 1994 GL is the shorter trail on the lower left. Spacewatch has also discovered new "Centaur" asteroids which orbit in the outer solar system between Saturn and Neptune. Our first Centaur discovery has been named Pholus and was found by Spacewatch in January 1992. 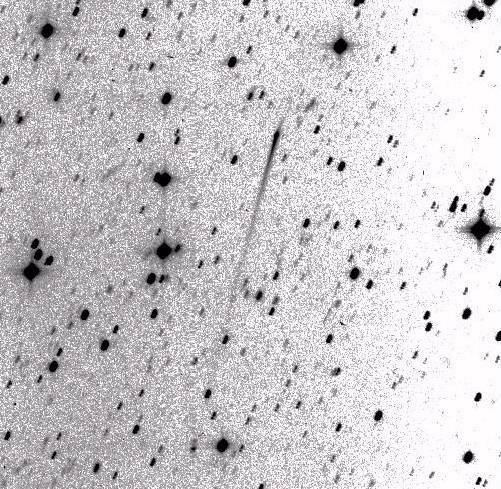 Spacewatch has observed and discovered many comets since our early observing programs first started in 1984. 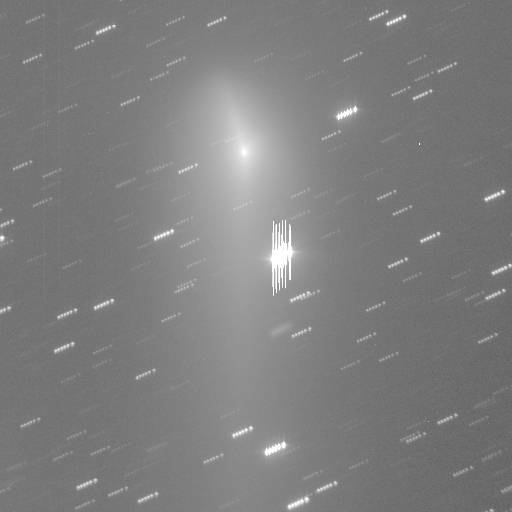 Comet C/2012 S1 (ISON) was imaged on 2013 March 5 by Jim Scotti at the Spacewatch 1.8-m telescope. Comet ISON is expected to put on a good show in late 2013 when it passes 0.012 AU from the Sun in November and if it survives that close approach, it will fly over planet Earth at only 0.4 AU and put on a show for us Earthlings. 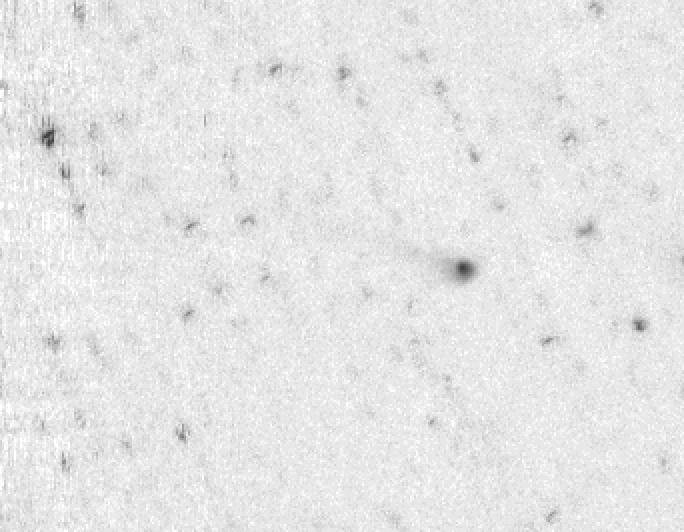 The comet has recently started growing a tail that is visible in this image extending more than 0.6 arcminutes to the left (p.a. 96 degrees). East is at left, north at bottom. See the next image for a better view of the fainter parts of the tail. 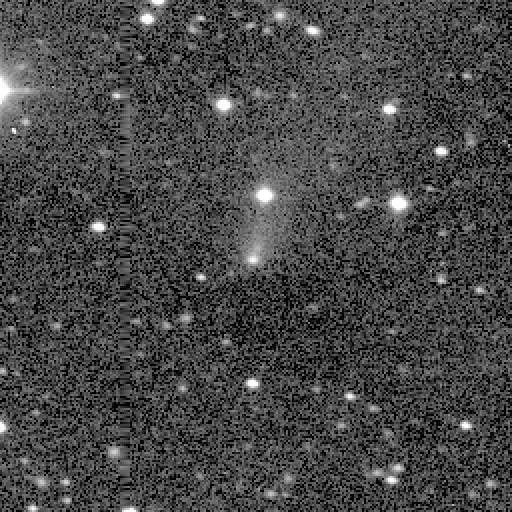 Comet C/2012 S1 (ISON) was imaged on 2013 March 5 by Jim Scotti at the Spacewatch 1.8-m telescope. This alternate view of the previous image shows the fainter tail extension out to almost a full arcminute. Comet 48P/Johnson was observed on 2013 February 6 while showing some unusual structure seen in this negative image obtained by Jim Scotti with the Spacewatch 1.8-m telescope. This image is the sum of 27 - 60 second exposures co-added to show the comets morphology. You can see the relatively sharp nuclear condensation embedded in an elongated almost uniform surface brightness coma and a very faint tail structure to its lower right. This image has north at bottom and east at left. The coma was found to be about 15 arcseconds by 32 arcseconds and the tail extends in two parts to about 1.7 arcminutes towards p.a. 256 degrees and 1.4 arcminutes in p.a. 240 degrees. 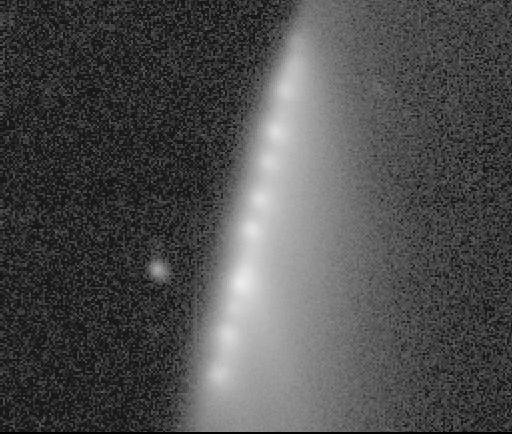 Comet 17P (Holmes) was here photographed in "outburst", becoming suddenly and unexpectedly 1 million times brighter than it was ten days earlier. Image was obtained by Spacewatch observer Mike Read, on 2007, Nov. 4, with the Spacewatch 0.9-m Mosaic telescope. The dust and gas envelope of the comet was then larger on the sky than the apparent diameter of the Moon. Photo by Mike Read; Copyright 2007, Arizona Board of Regents. 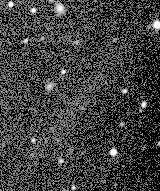 C/2003 A2 (Gleason) was the first Spacewatch comet discovery in 2003. It was found at the Spacewatch 1.8-m telescope by Arianna Gleason on 2003 January 10. Observer credit: Arianna Gleason. C/2003 A2 (Gleason). 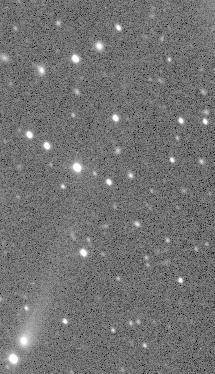 The follow up on the Spacewatch 1.8-m telescope by Tom Gehrels on 2003 January 13. 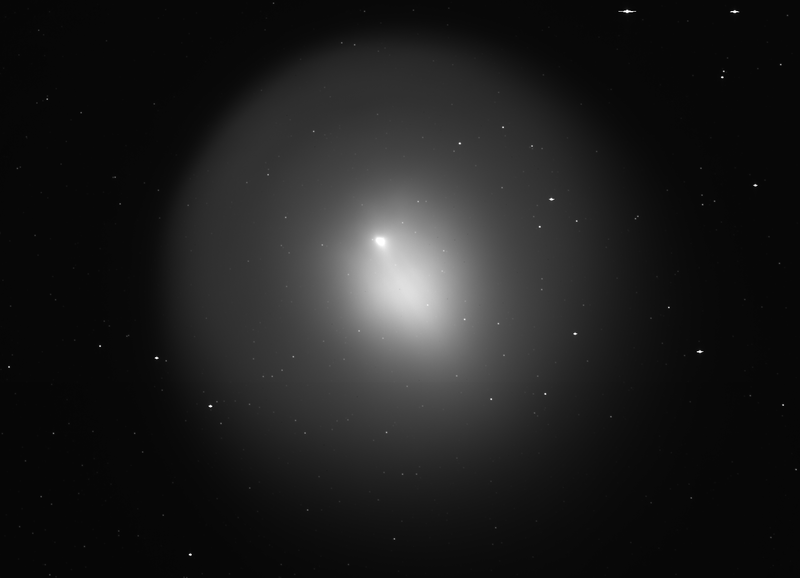 C/2000 A1 (Montani) was the first new comet discovery of the 2000s. It was found at the Spacewatch 0.9-m telescope by Joe Montani on 2000 January 12. Click here for more information. Observer credit: Joe Montani. 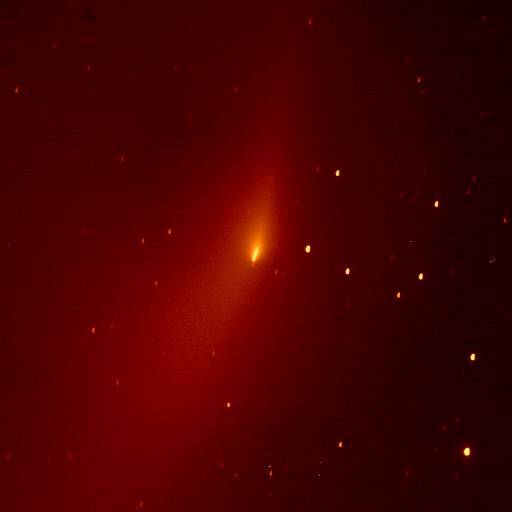 This comet was discovered by Joe Montani at Spacewatch on 1998 June 30. This is a series of images showing the motion of the comet over a period of 16 minutes. These observations were made the next night when the comet was near the top of a chain of five stars. The coma diameter is 6-8 arcseconds. 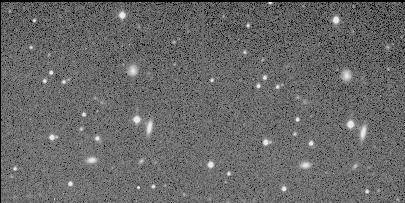 A very faint tail is seen with difficulty in the images to the left (South). East in these images is at the bottom. No additional image processing was performed on the images and they appear directly as they then came from the telescope (1998 July 1). Observer credit: Joe Montani. This comet was discovered by Spacewatch observer Jeff Larsen on the night of 1998 June 24. This image is a median combination of the 6 images obtained on the discovery night, with an effective integration time of about 673 seconds. The coma diameter is 15 arcseconds in diameter and the faint tail extends over 2 arcminutes off to the left. This image is 6 arcminutes wide and 4.5 arcminutes tall with North at right and West to the bottom (1998 June 24). Observer credit: Jeff Larsen. This comet was discovered by Spacewatch observer Jeff Larsen on the night of 1997 November 3. This image is one of the 3 discovery images. The total integration time is just under 2.5 minutes. The comet is total magnitude 16.6 and has a nuclear magnitude of about 19.5. The faint tail was seen to extend 0.89 arcminutes in p.a. 258 degrees and is seen to extend to the right and slightly down. The coma is about 14 arcseconds across. This image is 9 arcminutes square with North at top and West to the right (1997 November 3, 06:29 UT). Observer credit: Jeff Larsen. This image is a result of co-adding the 9 images taken on the discovery night, giving a total integration time of about 22 minutes. Compare this image to the one above; this image shows much fainter details in both the coma and the tail. The multiple star images in a row are an artifact of co-adding the images after accounting for the comet's motion. 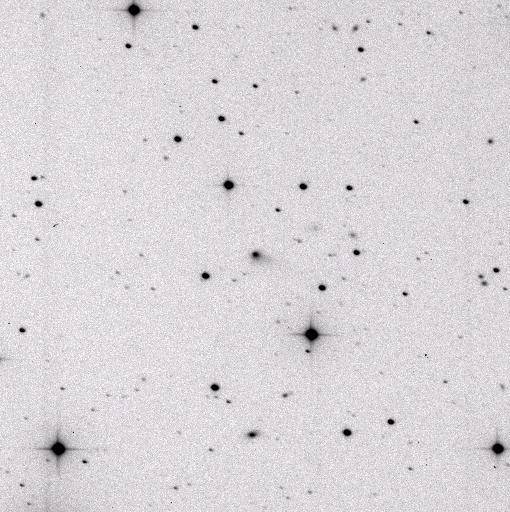 This image is 7 arcminutes square with North at top and West to the right (1997 November 3, 05:27 - 09:02 UT). Observer credit: Jeff Larsen. This is a co-added image showing the extent of the tails and sharpness of the nuclear region. North is at right, East at top. Field of view is about 9 arcminutes, square. Total exposure time about 445 seconds (1996 September 21). Observer credit: Jim Scotti. The same co-added image, showing the extent of the tails in more detail with a more extreme contrast stretch. Observer credit: Jim Scotti. 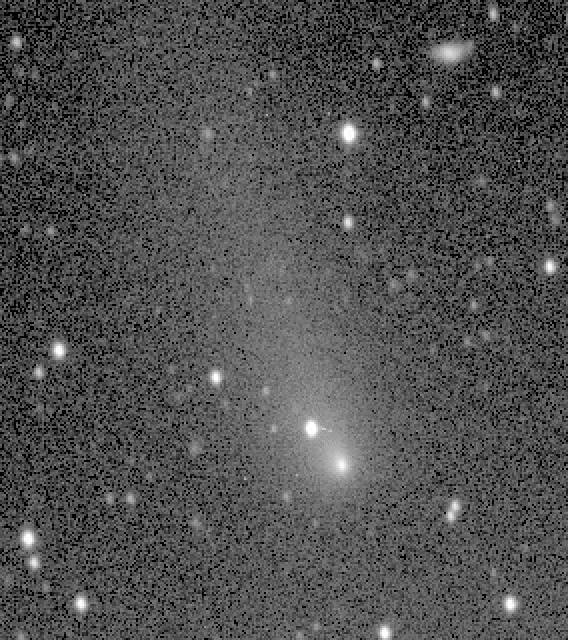 This is the 3rd image of a new 17th magnitude comet discovered on the night of 1996 January 14 by Robert and Vicky Jedicke with the Spacewatch Telescope. In the first image, the nucleus of the comet was very close to the star that is just below and left of the comet. North is to the right, and East at top in this image. 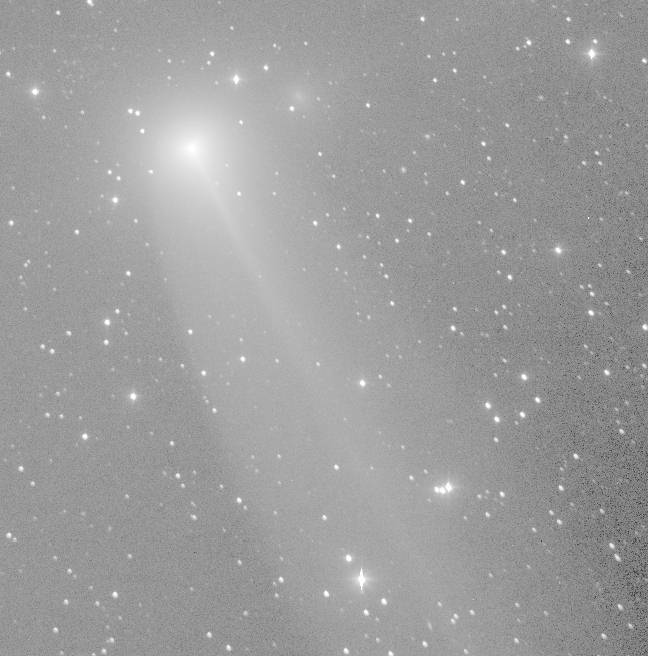 The coma is about 20 arcseconds in diameter and the tail extends to at least 5 arcminutes (1996 January 14, 07:36 UT). Observer credit: Rob Jedicke. 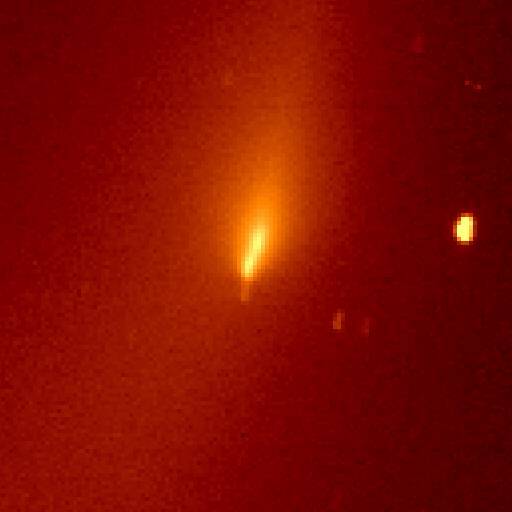 The comet is in outburst with a jet-like feature extending to the North (the right) in this image (1995 November 14). Observer credit: Jim Scotti. A month and a half later... The activity level has reduced since the image obtained on November 14, above (1995 December 31). Observer credit: Jim Scotti. These image pairs are of P/Schwassmann-Wachmann 3, taken with the 0.9-m Spacewatch telescope by Jim Scotti. 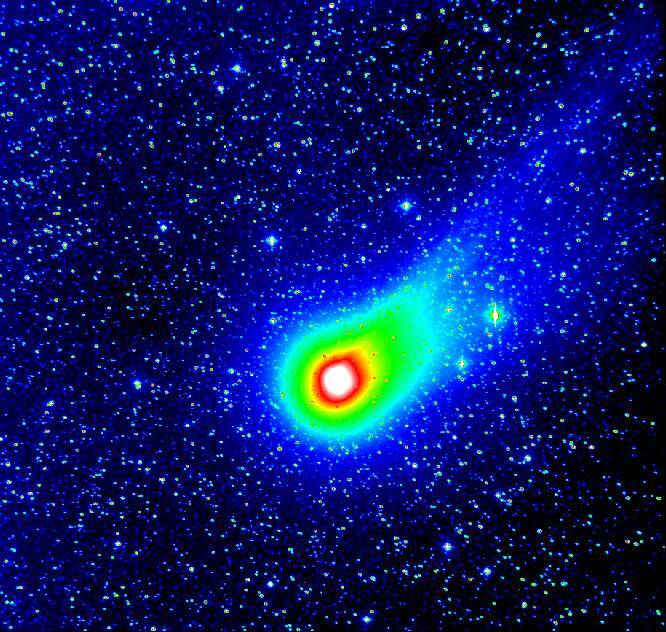 The left image is a closeup of the nuclear region, showing at least 2 individual nuclei in the recently split comet. 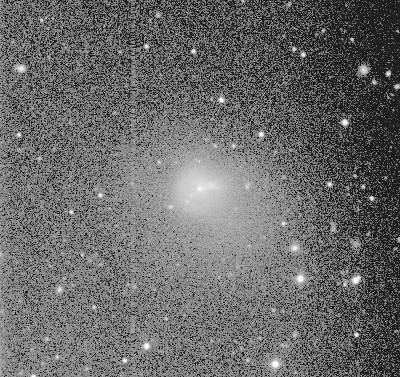 The right image shows more of the comet including a complex inner coma/tail structure. 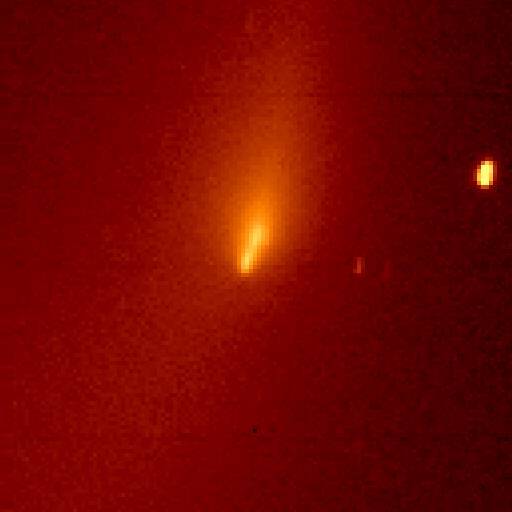 Comet Borrelly. A very bright, distinct object (1994 December 9). Observer credit: Jim Scotti. Over a year later... It has all but vanished. 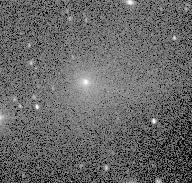 The comet is the very faint tail running diagonally from lower left where the very faint nucleus is located to the top right. The nuclear region is about total magnitude 22. Compare this to the image of the comet obtained earlier when it was near its peak activity, above (1995 December 31). Observer credit: Jim Scotti. 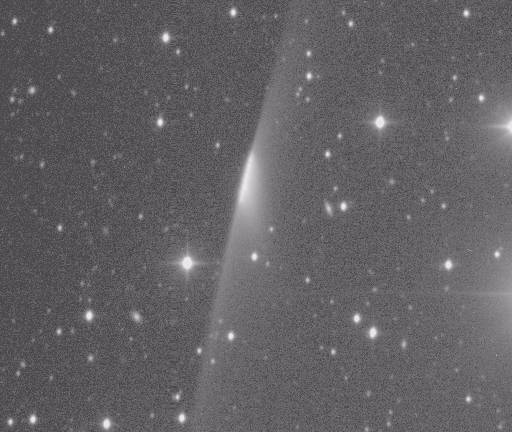 Comet Encke. A mosaic of images from 4 consecutive lunations during the comet's 1994 apparition. 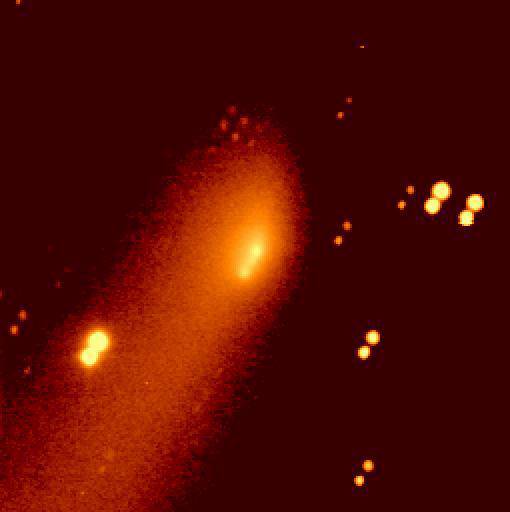 Note that this comet has split. The faint secondary nucleus is just above the brighter principal nucleus. Image obtained with the Steward Observatory 2.3-m telescope on Kitt Peak by Wieslaw Z. Wisniewski, showing the nuclear train shortly after its discovery. 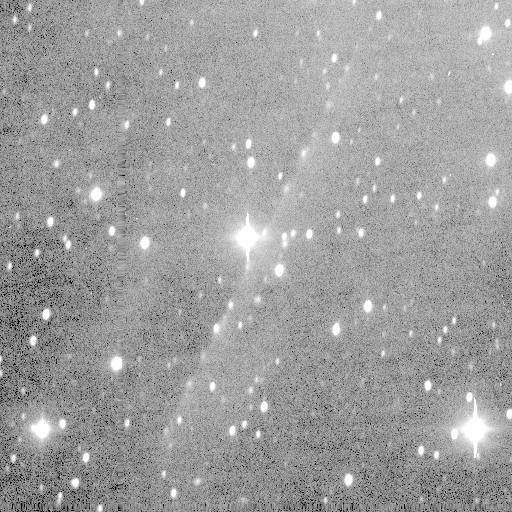 Image obtained with the Spacewatch Telescope of the famous Shoemaker-Levy 9 comet, showing the nuclear train with individual tails and the dust wings shortly after discovery. 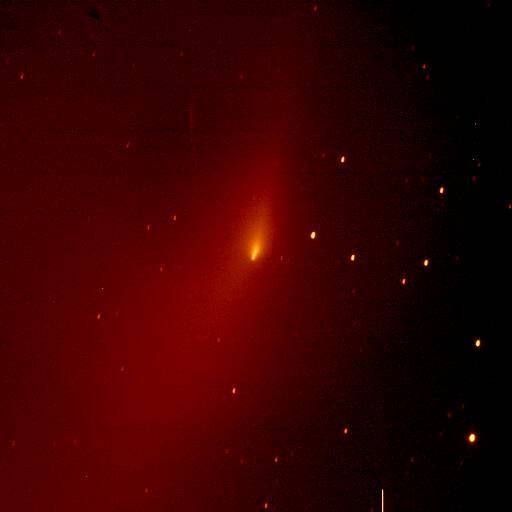 This is a false color image of comet Swift-Tuttle obtained with the Spacewatch Telescope. (1992 November 24). Observer credit: Jim Scotti. This is a mosaic of images from 8 consecutive nights, showing the night-to-night changes in the inner coma of the comet. Notice that every 4th image, 3 days apart bear striking similarity, demonstrating the rotational period of the nucleus which is just under 3 days! (1992 November 25 - December 2). Observer credit: Jim Scotti. This is a mosaic of images, showing rapid motion of features in the gas tail over the course of about a half hour. (1992 December 1). Observer credit: Jim Scotti. 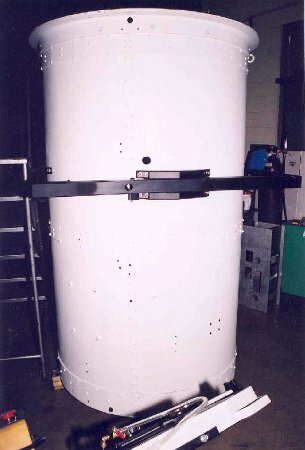 (Photograph by Robert S. McMillan) The new cryostat for the CCD mosaic before it was installed on the 0.9-meter telescope. 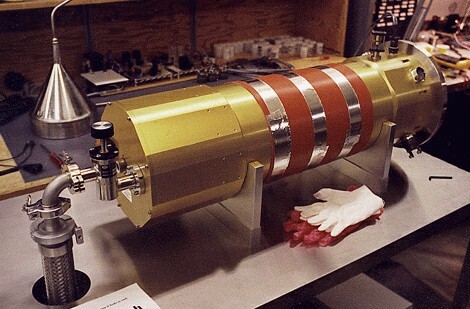 The instrument spider assembly. 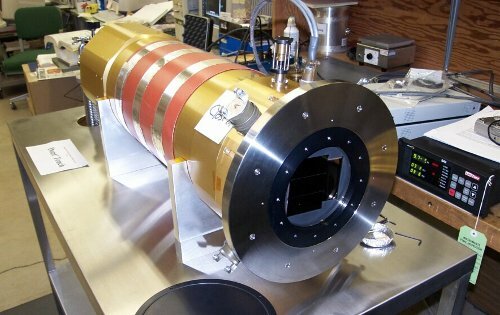 This holds and precisely positions the optical corrector as well as the camera cryostat containing the mosaic of 4 CCD imaging detectors. At left is Spacewatch Chief Engineer, Marcus Perry, and at right is Instrument Maker, Bill Verts, of LPL. 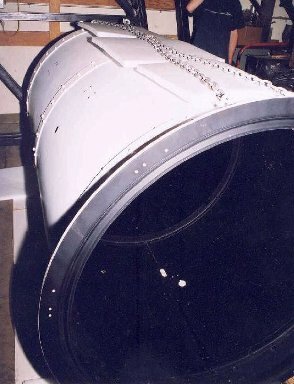 The large central cylinder has been covered with black "flock" cloth since the time of this photograph. The new 37 inch diameter mirror blank before polishing or coating. Back side of the new Wangsness 37 inch mirror blank which was designed to fit an 18 point support system. 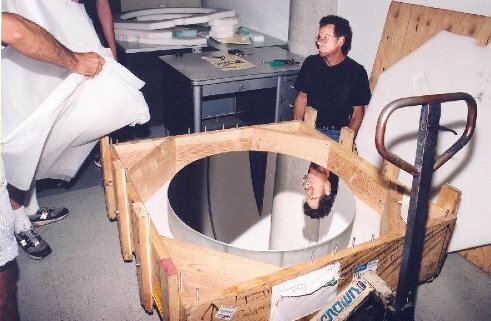 The Mosaic mirror arrived at our Lab from the coater on Sept. 24, 2002. 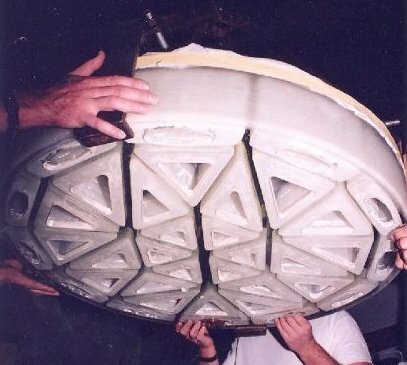 This image depicts the mirror still in its wood air-freight crate; our form-fitting foam packing has been removed from around the edge of the mirror. The very highly reflecting overcoated Silver coating reflects more than 99.5% of incident light across our working bandpass, and the reflectivity peaks at 99.7-99.8% at 700 nm, the center of our bandpass. The lightweighted mirror weighs only 225 pounds (about 100 kg), or 35% the weight of a solid glass mirror of this size. Clear aperture is 36.75 inches (93.35 cm). Mike Williams, LPL Senior Staff Engineer, is seen near the mirror, and reflected in it. A view from the bottom of the mirror: the open triangular cells are visible (and oblong cells near the perimeter of the mirror). Through the inspection-polished bottom surface one may see the thickness of the Pyrex glass ribs between the open cells. The new primary mirror cell, powder coated white. This cell has excellent ventilation, and will keep the new lightweighted telescope mirror very close to nighttime ambient air temperature. It is provided with an 18-point support system, and a novel radial support system designed by Mike Williams, LPL Senior Staff Engineer. 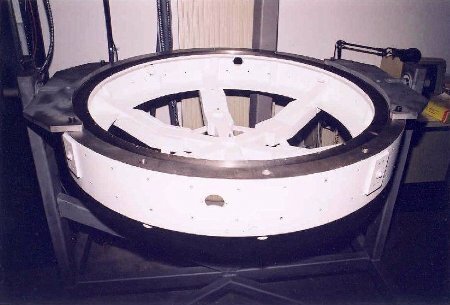 The mirror cell is shown here completed and assembled. 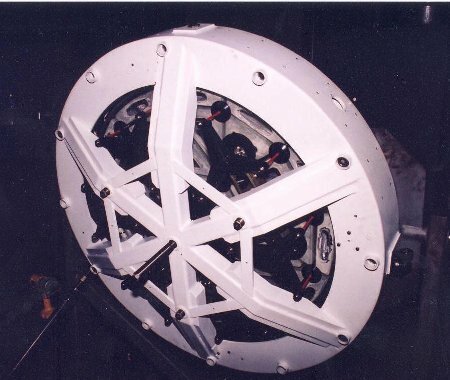 The axial and radial support pads and flexure struts preserve the accuracy of the mirror figure while the mirror undergoes varying gravitational loading as the telescope points to different angles in the sky. 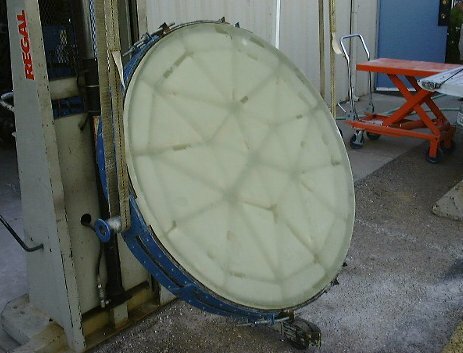 The central lifting pad is seen fully extended: this lifts the mirror from the cell when cleaning or recoating is needed. 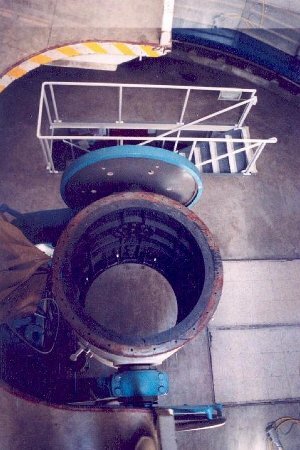 A view from the observing floor of the cast-iron center section of tubework to which attach the top tube section and mirror cell. 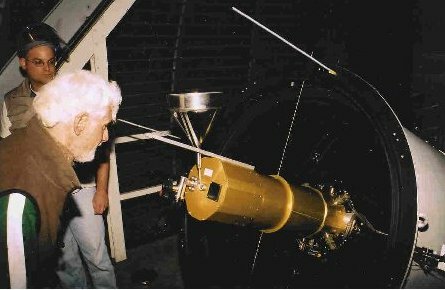 Note the wood-circle grappling handle which was once used for positioning the telescope in Declination by hand (but not since the move to Kitt Peak in 1962, by which time both axes' motions were electrically motorized). The elevator platform is seen at the top. 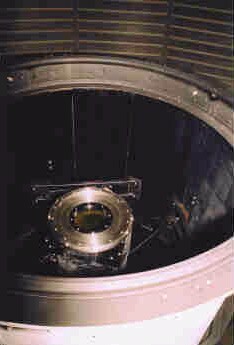 A vertigo-inducing view downwards from the "elevator" Newtonian platform of the 36-inch telescope dome towards the observing floor, showing the telescope with its top tube section removed, and mirror cell removed. We see the very heavy and strong cast-iron rib structure of the central tube section which is connected to (and turns with) the declination axle, made around 1920 by Warner and Swasey, in Cleveland, Ohio. Such a view has not been seen in forty years, when the telescope was moved from Tucson to its present site atop Kitt Peak. The original 80-year-old 7 foot-long top tube section of the telescope, at the LPL Machine Shop, just back from powder-coating (that's the Spacewatch Webmaster, Mike Read, toasting the occasion). A beautiful and durable hard white finish has been baked onto the outer surface of the tube, and a flat black finish on the inside of the tube. The powder coatings will protect the metal for decades without need for re-finishing, and they lend fine aesthetics. We have also now lined the inside of the tube with a very effective light-absorbing "flock" cloth fabric, to minimize scattered light, and possibly to allow us to observe closer to the moon (if necessary) than we have ever easily done. The powder-coated tube standing upright in the LPL Machine Shop. 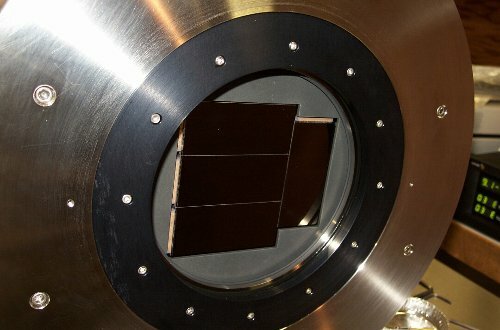 The square black frame which will support the instrument spider and allow for optical collimation adjustments as well as focus motions is seen about 2/5 of the way down from the top of the tube. 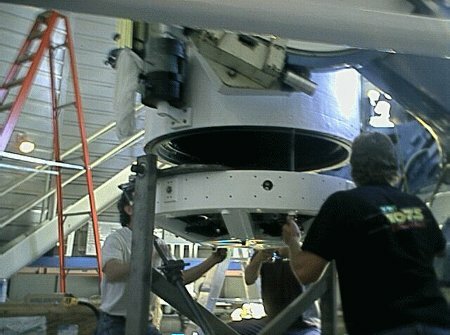 2002 October 9: Installation of the new primary mirror in its new cell. 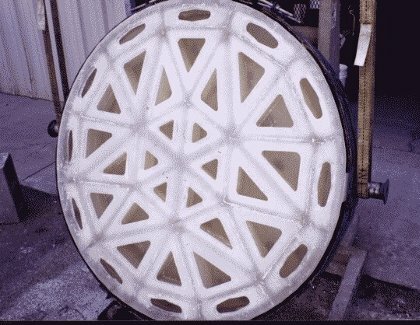 A study in symmetry: the lightweight Mosaic mirror seen from its back suface, fully installed in the mirror cell and supported by the axial and radial flotation system that the cell provides. The mirror is seen here installed and safely restrained in the cell. The cell is tilted to a large angle from the vertical (nearly so much that the mirror axis is pointed almost horizontally). 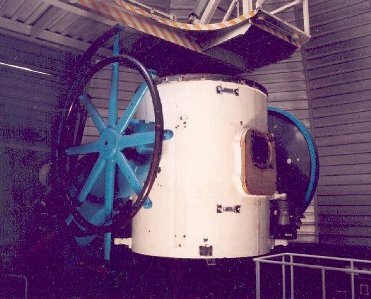 The mobile handling fixture enables tests and motions of this kind, as well as easy and secure installation and de-mounting of the mirror and cell on the telescope. Senior Research Specialist Joe Montani examines the recently reassembled telescope and the carefully restored refractor finder scope built by Alvan Clark and Sons in 1888. 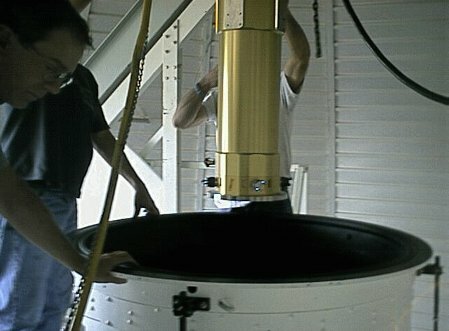 ( This fine telescope was removed from the 0.9-m telescope in 2013 March and handed over to Steward Observatory for display at their main campus location.) The new 0.9-meter primary mirror in its new cell is visible in the foreground. 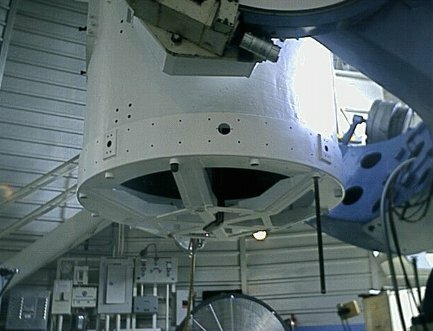 The linear actuators on the sides of the telescope control focus and tilt of the CCD. 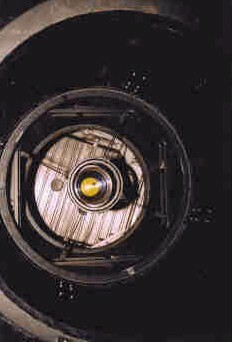 View of filtered light transmitted through the schott OG-515 filter and the field corrector lenses, seen from under the telescope before the mirror was installed. The inside surface of the telescope tube is coated with black flocking. 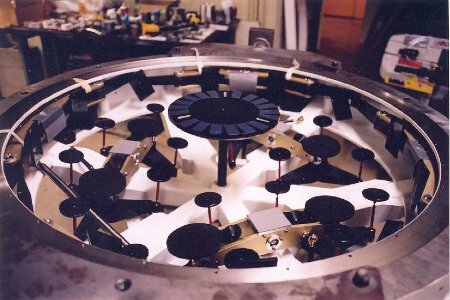 View of the field corrector lenses and filter from above, before installation of the CCD. 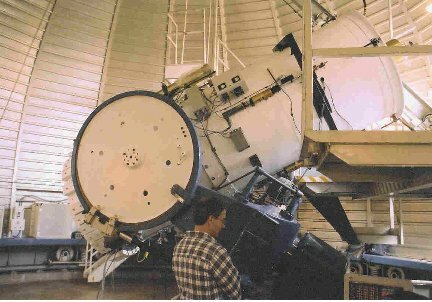 2002 October 9: Installation of the new primary mirror and its cell onto Spacewatch 0.9-meter telescope. 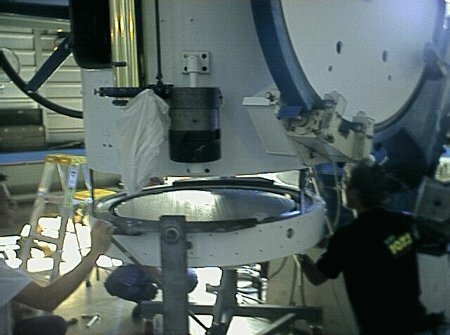 Installation of the new primary mirror and cell on 2002 Oct. 9. Left to right are Brett Lawrie, Joe Montani (hidden), Bill Verts and Mike Williams. 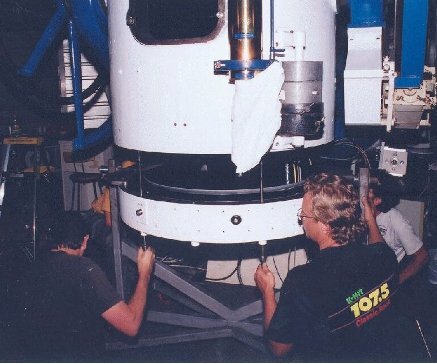 The new mirror cell is seen attached to the end of the telescope, on Kitt Peak. One can see here the great amount of free-air ventilation that the Mosaic mirror will enjoy; this will preserve image quality and help the Mosaic telescope to make faint detections. Mike Williams of the LPL Machine Shop installs a small format CCD at the corrected prime focus for initial determination of focus on 2002 Oct. 9. 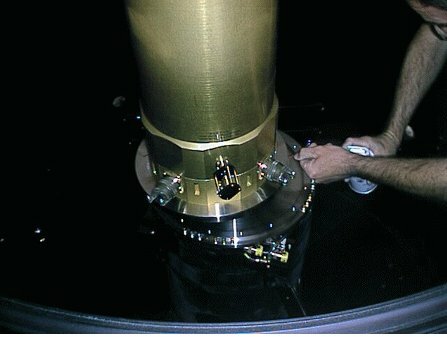 2002 October 14: Cryostat containing the mosaic of CCDs, rigged for hoisting onto the top end of the telescope. Brett Lawrie on the left, Mike Williams behind the cryostat, Bill Verts in the background on the right, and Marcus Perry making adjustments. Mosaic of CCDs being lowered onto the focal position on 2002 October 14. 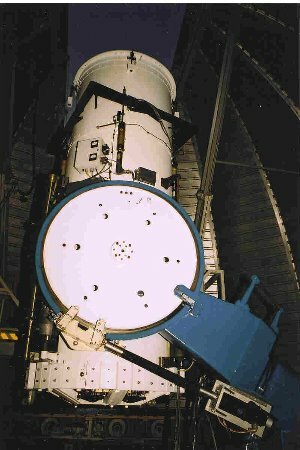 2002 October 14: Final installation of the mosaic of CCDs onto the focal position of the Spacewatch 0.9-meter telescope. 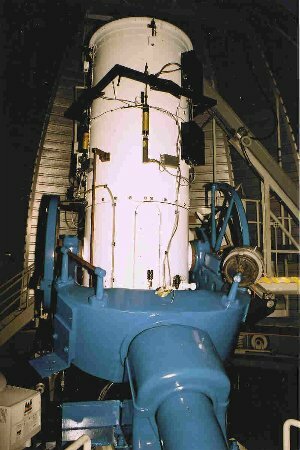 2002 October 21 - Spacewatch 0.9-meter telescope in new prime focus mode, viewed from the west. The square frame holds the center spider. On of four linear actuators for focus, tip, and tilt is at the upper center of the tube. The large declination drive gear and its motorized worm drive is in the foreground below. 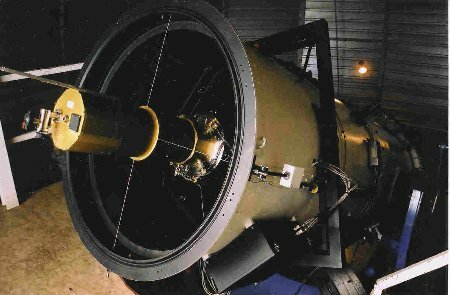 2002 October 21 - Spacewatch 0.9-meter telescope in new optical configuration undergoing engineering trials. Chief Engineer M. L. Perry and Staff Engineer T. H. Bressi in the background. Andrew Tubbiolo and Joe Montani prepare to fill the cryostat through the funnel placed in the end of the unit. 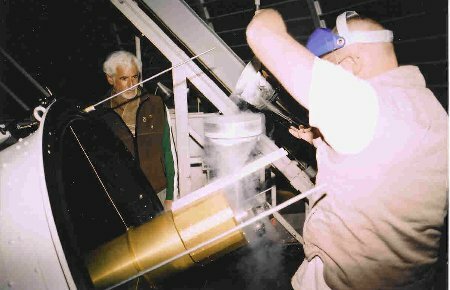 2002 October 21 - A. F. Tubbiolo fills the mosaic cryostat with liquid nitrogen at the prime focus of the Spacewatch 0.9-meter telescope while J. L. Montani looks on. 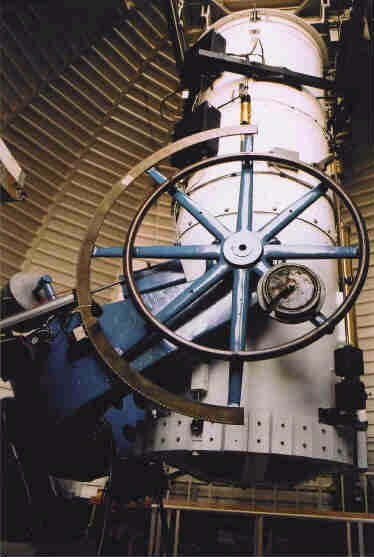 2002 October 21 - One of the best views of the recently restored antique brass refractor finder scope built by Alvan Clark and Sons in 1888. 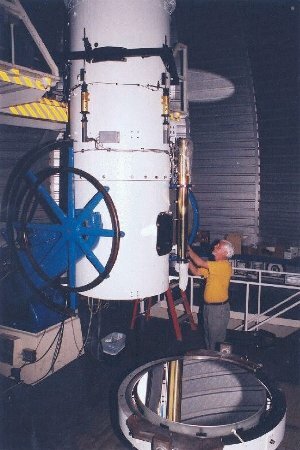 Engineer T. H. Bressi works at the telescope drive console. 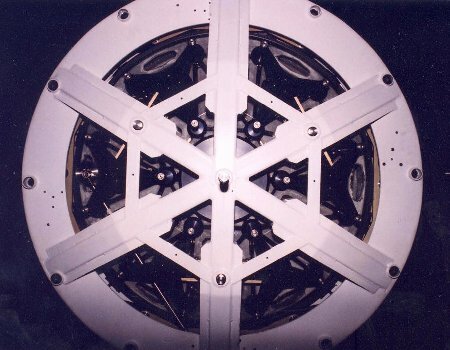 2002 October 21 - The front top end of the Spacewatch 0.9-meter telescope, showing the newly installed cryostat with the mosaic of CCDs. 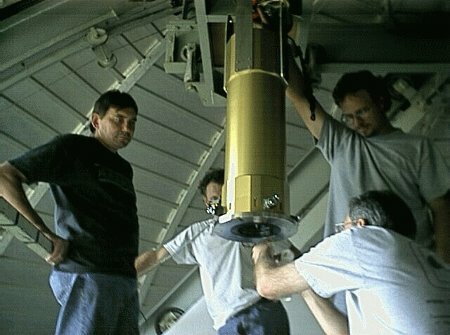 Four wires run from the gold-colored cylindrical cryostat to counter balancing weights that tension the wires and prevent the cryostat from sagging as the telescope points lower in the sky. The large black box at the lower right houses the electronics that control and read the four CCDs. 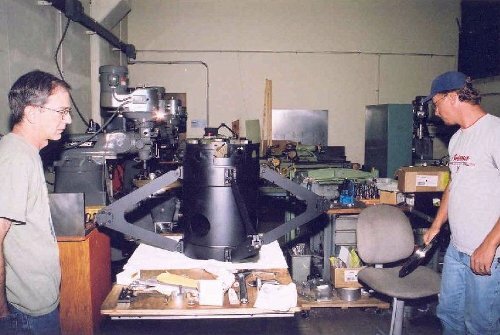 The square black frame around the telescope tube braces the spider inside the tube that holds the corrector lenses and the base of the cryostat. View of the telescope in Mosaic configuration, from the south. 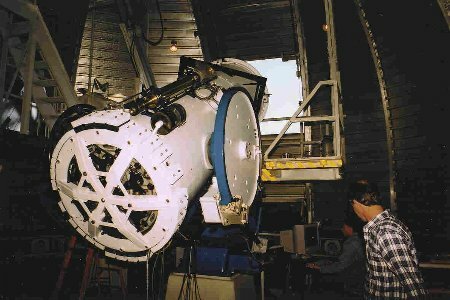 The Spacewatch 0.9-meter telescope reconfigured with new optics as of 2002 October 21. Note the shorter tube and the framework near the top to which the new central support spider is attached. The first detection of an asteroid (PHA 2002 TD66) was made with the mosaic of CCDs on October 23. Spacewatch has also imaged several other objects, such as manmade spacecraft. Spacewatch imaged the Cassini Spacecraft on the night of October 23, 1997 as it departed Earth 8 days after launch. It was 2.8 million kilometers from Earth when the following images were obtained. The image of the 20th magnitude spacecraft is near the center of each of the mosaic of 3 images. Observer credit: Joe Montani. Spacewatch imaged the Galileo Spacecraft on the night of November 28, 1992 as it made its second close flyby of Earth. It was 8.06 million kilometers from Earth when the following images were obtained - at the time, a record distance for an observation of a man-made spacecraft. 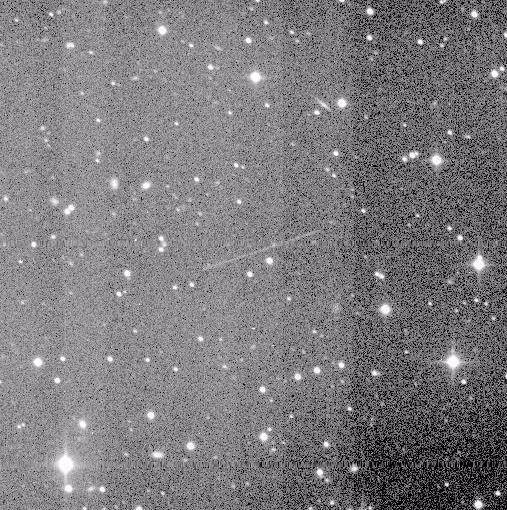 See if you can find the very faint 22nd magnitude image in this mosaic of 3 consecutive images. See also the mosaic shown below of the NEAR spacecraft (below). This was one of the possible targets of the Clementine 2 spacecraft mission. The asteroid had not been seen since a month after its discovery in 1987. The image shown is the result of subtracting 2 images taken about 40 minutes apart. Since the object was in relatively heavy Milky Way, it is difficult to see in the original images but stands out nicely as a black and white pair of images separated by some distance while field stars appear as black/white images that are involved with one another. 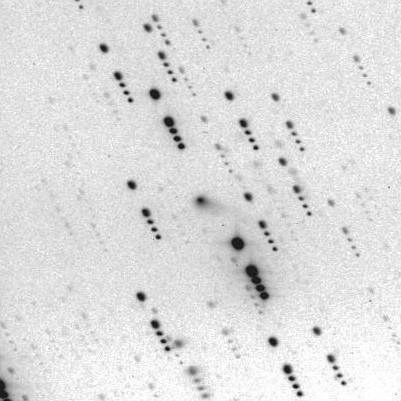 1987 OA moved about twice the distance that a Main Belt asteroid moved between images. Images of the NEAR spacecraft taken by Spacewatch on 1998 January 22 - less than 1 day before its closest approach during its Earth flyby. Jeff Larsen obtained this set of images of the NEAR spacecraft as it approached Earth for a gravitational assist flyby on its way to asteroid (433) Eros. 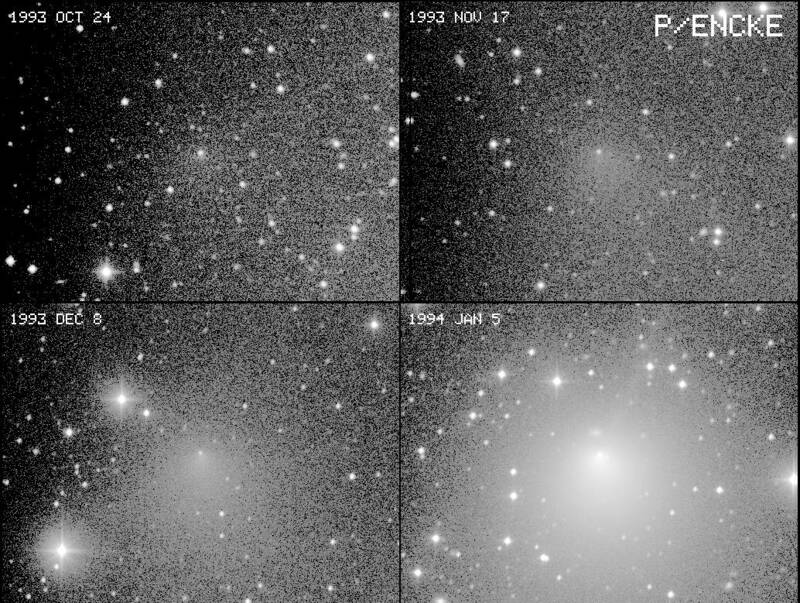 These images were obtained on 1998 Jan. 22 UT with the Spacewatch Telescope. This mosaic is comprised of 3 images, each 4.3 arcminutes square with north at right, west at bottom. You can see the faint trailed images of NEAR at the center of each of the 3 images that make up the mosaic. The images were obtained on 1998 Jan. 22 between 09:22 and 09:35 UT with the Spacewatch Telescope. The spacecraft was about 565,000 km from Earth at the time of observation. The Spacecraft was estimated to be about magnitude V=18.3 in these images. The mosaic was prepared by Jim Scotti from data obtained by Jeff Larsen. See images of the NEAR spacecraft taken by Spacewatch about 16 hours after launch. 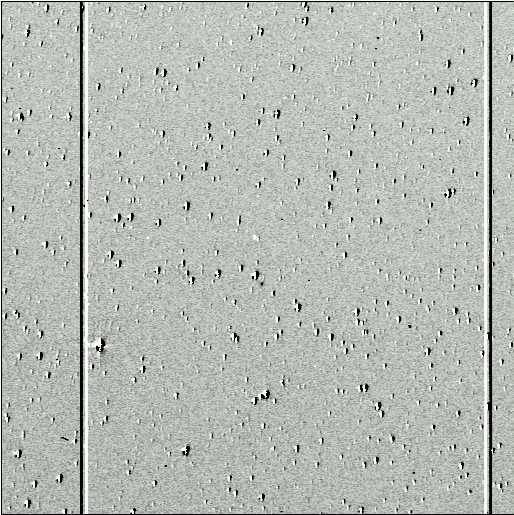 Robert Jedicke managed to get the following images of the NEAR spacecraft as it headed away from Earth on its way to (433) Eros. 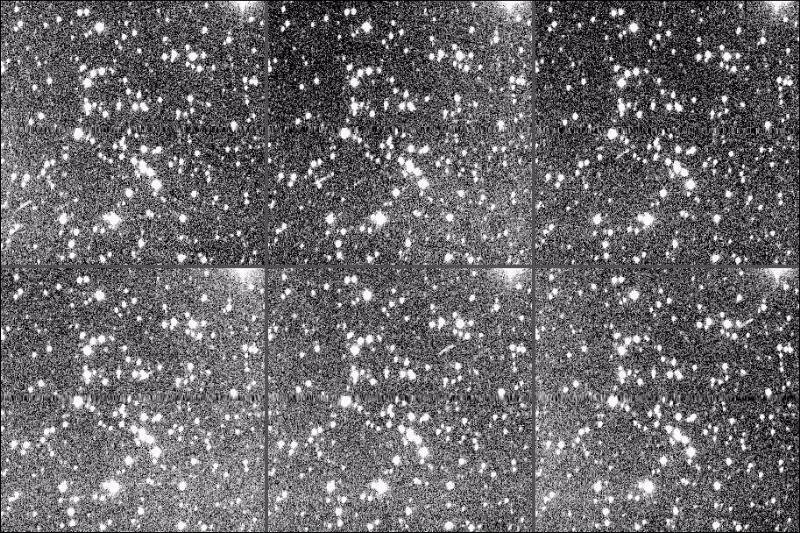 Click here to see a mosaic of 6 images obtained on 1996 Feb. 18 UT with the Spacewatch Telescope. For a reverse video version of the same image, click here. This mosaic is comprised of 6 images, each 5.3 arcminutes square with north at top, west at right. You can see the faint trailed images of NEAR and its booster traveling from about 8 o'clock to 2 o'clock in the frames. The images were obtained on 1996 Feb. 18 between 12:12 and 12:45 UT with the Spacewatch Telescope. The spacecraft was between 310,000 km and 320,000 km from Earth at the time of observation. This is a closeup of the first image of NEAR, taken on 1996 February 18 at 12:12:29 UT. The image is 4.5 arcminutes square with North on top and East at left. The NEAR spacecraft is the brighter trail to the left (east) near the center of the image, while the fainter trail is that of the booster. The spacecraft was estimated to be about V magnitude 20-20.5, while the fainter booster is perhaps about V magntiude 21. Thanks go to George Lewis at JPL for providing an ephemeris for the spacecraft. The image and mosaic was prepared by Jim Scotti in data obtained by Robert Jedicke. 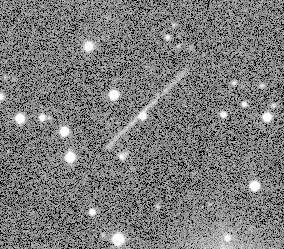 Spacewatch recently imaged the Geotail Spacecraft on the night of 1997 May 10 by Jeff Larsen. The spacecraft was about 186,000 kilometers away from Earth at the time. Click on the thumbnail above to see the full image which is about 9 arcminutes square with North at top and West on the right. The spacecraft appears as a faint trail near the center of the image. Our thanks go to George Lewis at JPL for the Geotail ephemeris.